During the winter of 2017 I had the pleasure of conducting several “How to Slow Cook Yourself Slim” classes for Weight Watchers of Arizona. 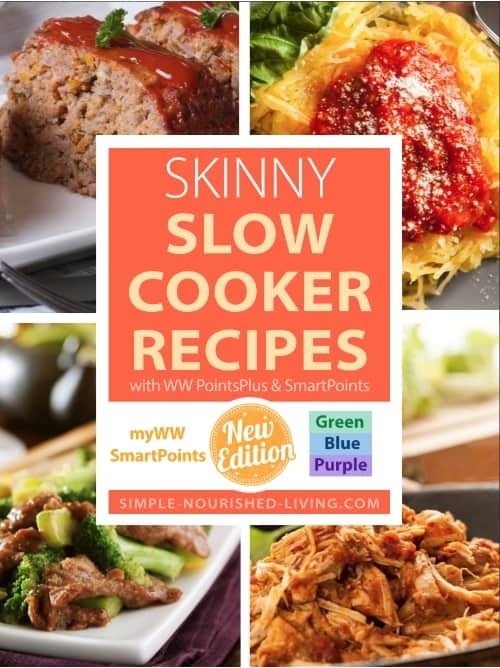 In October 2013, I set out to use my slow cooker every day for a year to make Weight Watchers friendly crock pot recipes that would be easy, healthy and delicious. And though I lost momentum at the halfway mark, I still continue to use my slow cooker several days a week. Before beginning my year of Weight Watchers friendly crock pot cooking challenge, I’d never really thought much about the link between losing weight and slow cooking. 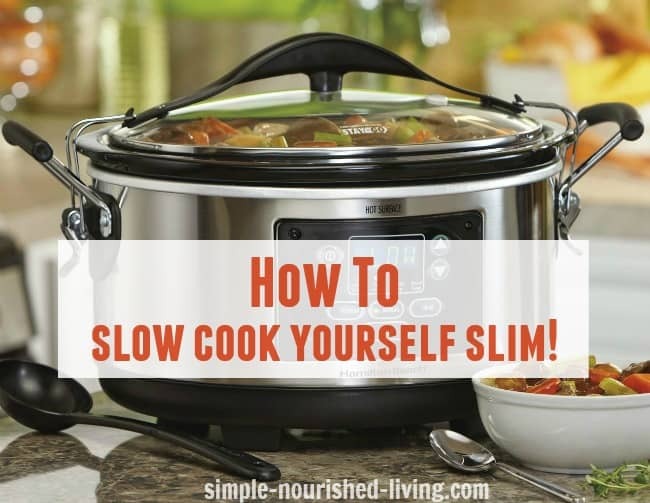 But the truth is, if you are trying to lose weight, your slow cooker can be your best friend. For most of us, dinner is the meal that often derails our best intentions when it comes to weight loss. After a long day of work, you arrive home tired and hungry. And the last thing you want to do is think about cooking dinner. So you end up grabbing the quickest thing you can get your hands on. And it’s rarely, if ever, light and healthy! But, with a crock pot instead of worrying all day about what to make for dinner, you know a healthy and delicious meal will be ready and waiting when you get home. 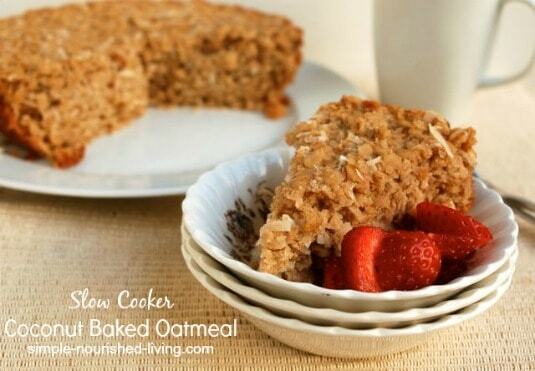 Or you can use your crock pot on the weekends to make light and healthy meals to warm up during the week. The crock pot makes it easy to cook healthy, affordable meals without having to spend hours in the kitchen. Have you heard the saying, “20 minutes in the kitchen can save you 3 hours on the treadmill (affiliate link)“? 1. Makes meal planning easier. 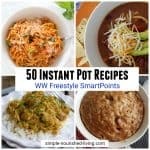 Many Weight Watchers crock pot recipes are complete one pot meals. 2. Requires planning which is critical to weight loss success. If we want to eat right and lose weight we need a plan. If we leave it to chance we’ll end up opting for high calorie convenience foods: take out, the drive-thru, fast food, the vending machine, etc. 3. Lends itself to big batch cooking and leftovers. Which can be re-purposed or portioned out for future meals. 4. Saves time in the kitchen. You can put your ingredients in the crock pot in the morning or afternoon and dinner will be ready when you want it. I love the convenience of investing a little time and then moving forward with my day, while dinner cooks, practically unattended. No pots boiling over, burned skillets and last minute rushing around to get dinner figured out. 5. Provides variety. You can make a lot more than pot roast, soup and chili in your slow cooker, as I’ve learned during the last six months. 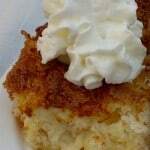 Appetizers, beverages, breakfasts, main dishes, side dishes and desserts are all possible with a slow cooker. 6. Makes cooking possible even for those with little kitchen know-how. Slow cooking is practical, realistic and very forgiving, perfect for novice cooks. Recipes tend to be straightforward with minimal ingredients and very few steps. Meals made in the slow cooker may not be the prettiest ever. But, they can be some of the tastiest. 7. Naturally low fat. Because crock pot cooking is a moist form of cooking it requires less fat, so you’ll save calories and points. 8. Perfect all year round. While most of us think of the slow cooker during the fall and winter, it’s the perfect summer kitchen device. I’ve received lots of comments from folks in hot climates who depend on their slow cooker all summer to avoid heating up the kitchen. 1. Pick the correct slow cooker for you. If you are new to slow cooking, figuring out which slow cooker to choose can take some research. There are such a wide variety of options of different sizes and styles on the market today. You’ll find an article to help you here. 2. Adapt your slow cooker for smaller portions. Put your ingredients into a smaller oven safe dish and then put the dish inside the slow cooker. 3. Get to know your slow cooker. Just like an oven, every crockpot tends to have its own personality. It might run at a some what hotter temperature than another. 4. Don’t overfill or under-fill it. For best results your slow cooker should be at least half full but no more than two-thirds full. If it is less full, your recipe will cook faster. If it is more full, your recipe will cook slower. For even cooking, cut food into uniform-size pieces. Root vegetables take longer to cook so they should be placed at the bottom of the cooker (items at the bottom cook faster). Then place the meat on top. Every time you take the top off your slow cooker the temperature inside drops several degrees and you extend the overall cooking time by 15 to 30 minutes. Waiting until the recipe is close to done will minimize this effect since you’re closer to done. Browning your meat and/or sautéing onions before adding them to the slow cooker will add more flavor to your finished dish. But you can skip this step and still get good results that are perfectly fine for everyday cooking. Plastic liners designed specifically for the slow cooker will help make cleanup a breeze. Coat your slow cooker with nonstick cooking spray. In a large bowl stir or whisk together all the ingredients until well blended. Pour mixture into your prepared slow cooker. Cover and cook on LOW for 3 to 5 hours, until the edges are golden brown and the center is set. Use whatever combination of low starch vegetables you like best. 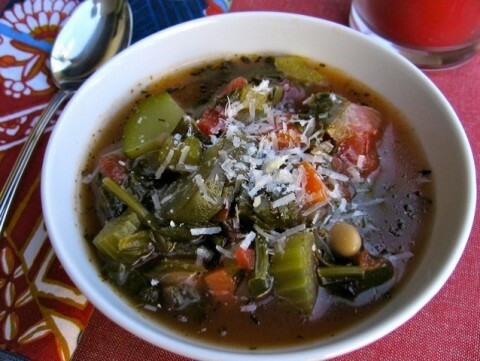 For a thicker soup, puree a portion of this soup and then add it back into the pot. Stir in some fresh chopped parsley or basil an added burst of freshness. Asian: ginger, garlic, soy sauce (skip the tomatoes and tomato paste) add bok choy, pea pods, bean sprouts, etc. Place the chicken in your slow cooker. Top with the salsa. Cover and cook on LOW until the chicken is tender, 4 to 6 hours. 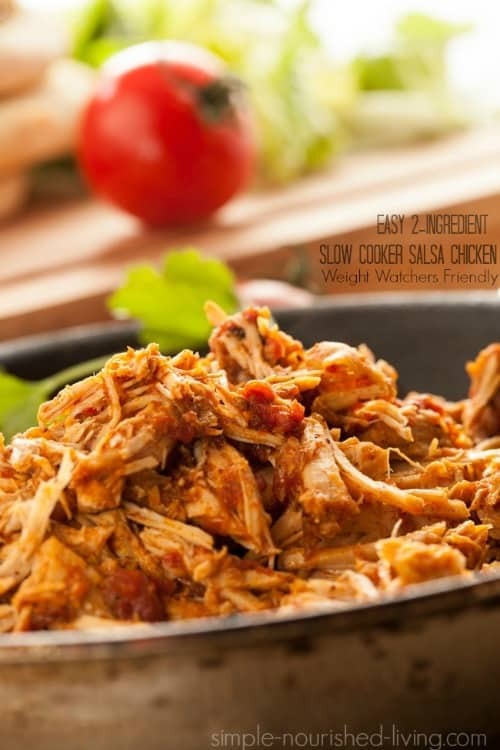 When cooked, remove the chicken and set on a large plate or cutting board (affiliate link) and shred with two forks. Add the shredded chicken back into the crock pot with the pots juices. Season to taste with salt and pepper. different salsas – red, green, chipotle, black bean, fruit, etc. different sauces – teriyaki, BBQ, curry, marinara, buffalo hot wing, etc. more veg – add chopped onion, bell pepper, jalapeño, corn, etc. fresh – add a squeeze of fresh lime juice and chopped fresh cilantro, parsley etc. 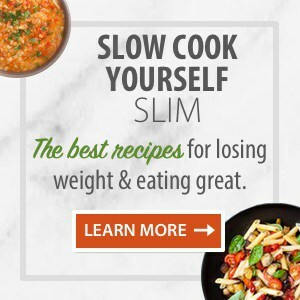 I hope you found this Slow Cook Yourself Slim session helpful. 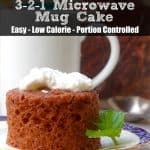 To learn more about using the slow cooker to lose weight while eating great, please visit me at simple-nourished-living.com. 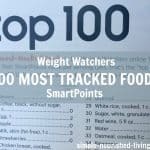 You’ll find hundreds of WW friendly recipes, weight loss success stories, tips & tricks, as well as a series of best-selling eCookbooks, including one filled with her favorite Skinny Slow Cooker Recipes – Freestyle SmartPoints Edition. Martha is a lifetime Weight Watcher committed to balancing her love of food and desire to stay slim while savoring life. 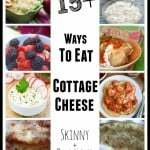 Her blog, Simple-Nourished-Living.com, is a popular resource for easy healthy recipes, success stories and weight loss tips to help you eat great and lose weight. A huge fan of the slow cooker and confessed cookbook addict, when she’s not experimenting in the kitchen, you’ll find Martha helping beginners over the age of 50 discover the powerful benefits of yoga. Previous Post: « New Year New You $500 Visa Gift Card Giveaway to Celebrate the Season! I have purchased your Smart 28-day Challenge, Comfort Food Favorites , Skinny Slow Cooker Recipes, and Skinny Soups books before Weight Watchers changed to Freestyle. 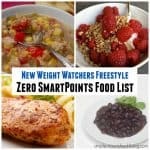 How may I obtain the new Freestyle Smartpoints for these recipes?